U.S. Variable Frequency Drive Market size in 2018 surpassed an annual installation of 2 million units and is anticipated to exceed USD 3.5 billion by 2025. Growing environmental concerns along with the introduction of standards and directives toward energy efficiency will augment the U.S. VFD market size. Rapid industrialization, rising urbanization, and the shifting focus on energy optimization across various industrial peripherals are positively influencing the product demand. In addition, government funds & incentives, research & development investments, technological advancements, and growing demand for operational upgrade are a few indispensable parameters reinforcing the industry outlook. Technological advancements coupled with integration of energy consumption monitoring & control will escalate the micro VFD market growth. These drives provide accurate and wide-range speed and torque control with high efficiency, limited maintenance and compact size. The global infrastructure fund flow, in 2016 exceeded USD 79 trillion across major large-scale industries including telecommunication, energy, water and transport. Medium variable frequency drive market across the U.S. is predicted to grow at a rate of over 1.9% by 2025. Ability to provide quick return on investment and user’s profitability enhancement by improving the process will strengthen the product penetration. These units will witness substantial upsurge on account of declining operating cost, increasing system reliability, reduced equipment setup time, low maintenance, energy savings and power factor control. Higher energy efficiency, specification to withstand rapid speed changes, ability to be controlled over a network, along with ease of monitoring are imperatives strengthening the AC VFD market share. Growing demand for processed food in line with rising consumer inclination towards value added products will further complement the industry dynamics. DC variable frequency drive market is anticipated to exceed an annual installation of 600’000 units by 2025. High start-up torque, simple circuits, and constant speed are key factors positively influencing the product penetration. Although, these units require high maintenance, can abrade over time and often suffer mechanical problems have been restraining the product adoption. However, DC drives are less complicated in comparison to AC drives, possess easy installation coupled with enhanced programming software offered by drive manufacturers will further stimulate the business landscape. Stringent energy efficiency norms coupled with advancement in existing technologies across small and medium enterprises (SME’s) will augment the adoption of low voltage drives. In addition, growing integration of low voltage units on account of their compact size across various industries including cement, petrochemicals, food & beverage, and other small-scale utilities will further amplify the U.S. VFD market. In the current industrial regime, medium-voltage drives have witness significant upsurge owing to their wide applicability across the industrial and commercial establishments. Ongoing refurbishment & retrofitting across the existing technologies in accordance with the industry codes and standards has infused a favourable business scenario. Growing fund allocation along with shifting industrial focus towards the enhancement of existing units across the nation will further sway the variable frequency drive market. Compact size, light weight, product flexibility & versatility, and cost competitiveness in comparison to the traditional speed control units are few essential factors upscaling the adoption of standard VFD market share. These units have witnessed growth on account of their wide range deployment across industries with primary applications with pumps, fans and conveyors. Te technology poses immense potential owing to their easy installation, product engineering and customization which in turn will nurture the industry landscape. Regenerative drives offer optimized space & cost, minimized downtime, maximized motor efficiency & performance, easy energy recovery and optimum utilization of recovered energy. 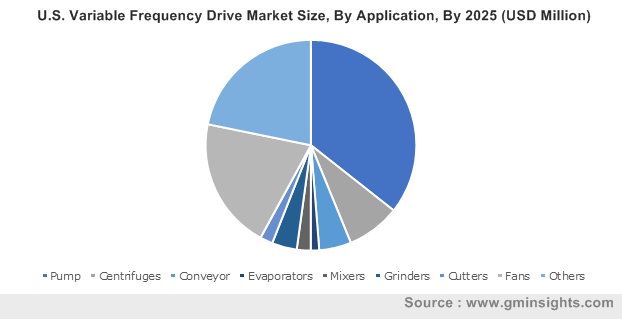 The continuous quest for new technologies that can combine electrical insulation, mechanical strength and thermal conductivity, to enhance the reliability of drives and motors has further escalated the variable frequency drive market growth. Pumps hold the majority share amongst other applications and will continue to grow in accordance to their deployment across large-scale manufacturing industries and small-scale utilities. Increasing adoption of speed control devices along with growing demand for safe & reliable technologies to curb faults and short circuits will further augment the U.S. VFD market size. Over the years, deployment of VFDs has witnessed extensive upsurge with respect to HVAC applications, primarily through capacity modulation. However, these units have observed large scale installation driven by their advanced energy saving feature and cost competitiveness. Ongoing modifications in applicable codes and standards have mandated the integration of these units across food industry equipment which in turn has reinstated the variable frequency drive market. Shifting focus towards energy efficiency along with minimizing maintenance costs, lowering energy consumption and increasing productivity has obligated the manufacturers to adopt advanced technologies in compliance with existing codes and standards. 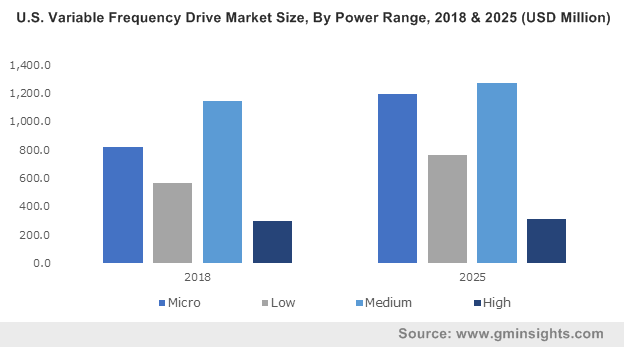 Rapid technological advancements coupled with introduction of innovative systems across the automotive industry will complement the U.S. variable frequency drive market. Moreover, rising investment across the automotive segment by leading industry participants will further complement the business landscape. 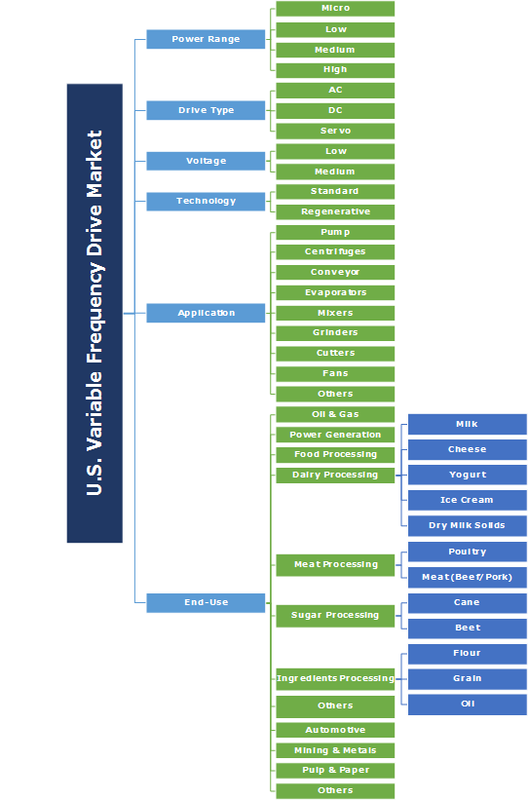 Eminent variable frequency drive market participants across the U.S. include Johnson Controls, Honeywell, ABB, Emerson, Siemens, Schneider, CG, Mitsubishi, Eaton, Fuji, Rockwell, WEG Electric, Yaskawa, Hiconics, Danfoss and Hitachi. A variable frequency drive also known as variable speed drive is a kind of adjustable speed drive which is technically utilized in electro-mechanical drives to control torque and AC motor speed by varying motor input voltage and frequency.